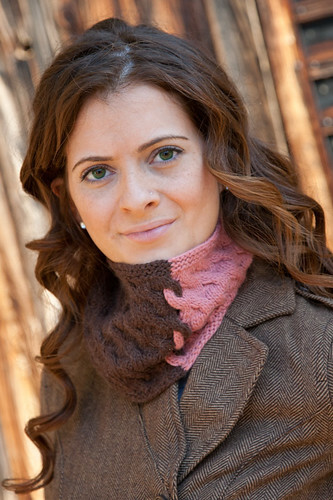 I’m pleased to announce the release of my latest pattern: a two-color, knit-flat, in-the-round, cabled cowl. Bifurcate Kumara Cowl was featured in Issue 218 of Classic Elite’s Webletter (if you aren’t already a subscriber, sign up! free patterns, once a week! can’t beat that 🙂 ). This two color cowl is a show-stopper, and its construction is incredibly clever. How’s this for a brain-teaser…the entire cowl is knit back and forth, NOT in the round. Curious? This ingenious design comes from Rachel Henry, the designer who brought us one of our most popular Web-Letters to date, the Cotton Bam Boo Kudzu Shawlette. There is no cozier yarn than Kumara, with its soft, lofty blend of extrafine Merino and baby camel hair. The camel hair is undyed, resulting in a muted effect that performs in perfect harmony with the sophisticated palette of 23 colors. Baby camel, a fiber with a softness rivaling cashmere, is expensive on its own, but you’ll find it in this decadent blend at an affordable price. This yarn is pure luxury! Design/Skills Needed: This cowl is “knit flat” in the sense that it is worked back-and-forth, with RS and WS rows. When the colors cross, the RS and WS rows overlap a little bit — it’s easier to do than describe! However, this cowl is also “knit in the round” in the sense that it is worked row-by-row and there is no long vertical seam. 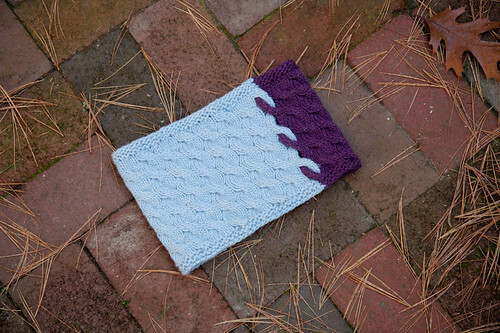 If you can cable and follow directions carefully, you can make this cowl. 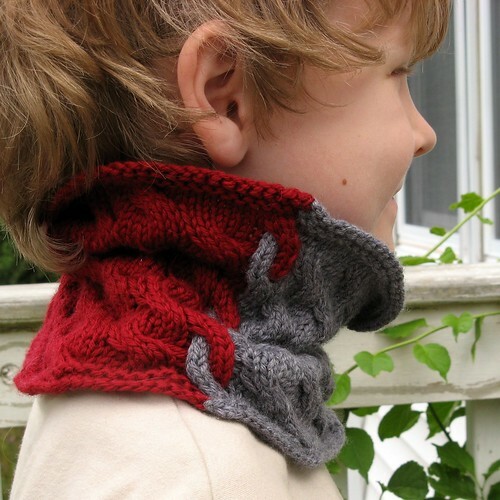 Inspiration: My youngest son saw me working on a lacy cowl for myself, and asked if I would make him a neckwarmer too. I showed him my stash, and he chose a dark red and light grey and instructed me to make it “half one color and half the other, like this,” holding his hands up to his own neck. 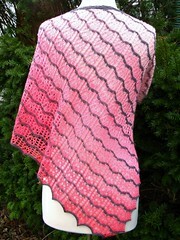 This request was the initial inspiration for this two-color, knit-flat, in-the-round, cabled cowl. I knew I wanted to use simple cables, with no separation, to make subtle overall pattern that would also give the cowl some vertical structure. Almost right away, I could see in my head how the two halves could meet and twine together using this same cable pattern. I knew I could accomplish this by knitting first one half and then the other, but I wanted to make it all at once – in the round, at least nominally. The first prototype, now in my son’s coat pocket, looked great. “Bifurcate” is the second generation of this original cowl, and is improved in several small ways. I changed the top and bottom edge to be less flared, and used different yarn and stitch counts to create an adult-sized cowl. 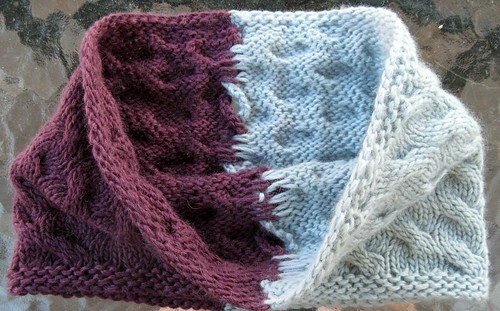 I chose soft, luscious Kumara for it’s to-die-for touchability and great stitch definition. When washed and block, the soft halo is lovely.